Mobile Bay (orange silks) gets a head in front of Grande Basin to score back to back victories in the Louisiana Champions Day Classic at Fair Grounds. The premier event on Champions Day is the $150,000 Louisiana Champions Day Classic, which attracted a well-matched field of seven including last year's runner-up Grande Basin. Owned by William Deckwa, Jr. and John Carbo, the 6-year-old son of Good and Tough was a close second in last year's edition of the Classic to Louisiana legend Mobile Bay. He has a proven affinity for the main track at Fair Grounds as it is the only racetrack at he has won over. In 44 career starts, he has made six trips to the winner's circle, all of which took place at the New Orleans oval. Grande Basin's most recent victory took place in the Star Guitar Stakes back in April 2017, which is his lone stakes victory to date. In his most recent effort, he was second over the Stall-Wilson Turf Course where he was beaten a length in the Mr. Sulu Overnight Stakes on November 6 at 35-1 odds. Grande Basin will break from post six under jockey Miguel Mena at 3-1 morning line odds. He is trained by Eddie Johnston. The 5-2 morning line favorite for the Louisiana Champions Day Classic is Mallory Greiner's two-time stakes winner Underpressure, who will be targeting his third win this year for trainer Chris Richard. The 4-year-old son of Birdstone won two allowances races over the main track at Canterbury Park over the summer , both of which were run over one mile. 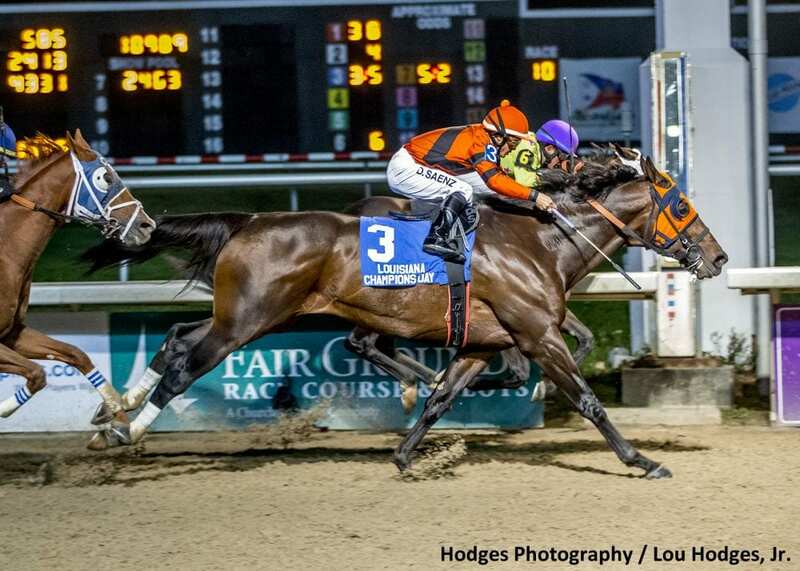 Last year, Underpressure won the Louisiana Bred Premier Night Prince Stakes in February 2017 at Delta Downs and that following July took the Louisiana Legends Cheval Stakes at Evangeline Downs. He was third in last year's Louisiana Champions Day Classic behind Mobile Bay and Grande Basin. Underpressure boasts the highest career bankroll in the Champions Day Classic field having acquired a total of $378,132. He will break from post three under jockey Corey Lanerie. Al and Bill Ulwelling and Joe Johnson's Morning Mischief (post two, 8-1, Mitchell Murill) is cross-entered in the Champions Day Classic and the Champions Day Turf. Trained by Gary Scherer, the 4-year-old son of Into Mischief broke his maiden at Delta Downs in November 2017 and has won two allowance events over the main track at Fair Grounds last meet. Completing the field for the Louisiana Champions Day Classic are Ready Prospector (post four, 8-1, Ty Kennedy), Mageez (post five, 7-2, Shaun Bridgmohan), and Zenucci (post seven, 6-1, Chantal Sutherland). The mile-and-a-sixteenth event for older horses features In The Navy, who won the Mr. Sulu Stakes over a firm Fair Grounds turf on November 16 in his most recent effort. Owned by Kendel Stanlee, the 4-year-old son of Midshipman is the lukewarm 3-1 morning line favorite and will be seeking his third stakes victory in the Champions Turf Stakes. Two starts prior to his triumph in the Mr. Sulu Stakes, In The Navy won the Louisiana Cup Turf at Louisiana Downs on August 4 by a half-length over Magic Vow (post three, 8-1, James Graham). In four starts over the Fair Grounds lawn, In The Navy has never finished off the board. In addition to his victory in the Mr. Sulu, he also won an allowance optional claiming event against Louisiana-breds on March 24. Jockey Adam Beschizza will pilot In The Navy from post eight for trainer Scott Gelner. Breaking from the rail, Wimborne Farm's Pont Du Gard has faced graded stakes company in four starts this year and will be back up against his own kind in the Champions Day Turf. Shipping in from his winter base at Tampa Bay Downs for trainer Ignacio Correas IV, the 3-year-old son of Liaison was off the board in all but one of his graded stakes starts when he was second beaten 2 ½ lengths in the Grade III Arlington Classic on May 26. His last victory took place over the Stall-Wilson Turf Course in a 7½-furlong allowance race against state-breds on March 9. He will be ridden by Joe Bravo. Battle At Sea (post two, 5-1, Corey Lanerie), Theoryintopractice (post four, 9-2, Colby Hernandez), Papa's Boy (post five, 15-1, Jack Gilligan), and Morning Mischief (post eight, 10-1, Mitchell Murrill) round out the field. First post on Louisiana Champions Day will be 12:30 p.m. CT. Free clubhouse admission will be available to members of the military with valid identification. In addition, the Louisiana Thoroughbred Breeders' Association will award a total of two scholarships worth $1,000. Registration for said scholarships will take place from 11:30a.m.-12:30 p.m. and will be awarded after the fifth race. This entry was posted in Racing and tagged autumn warrior, chris richard, eddie johnston, fair grounds, grande basin, louisiana bred, louisiana champions day, underpressure by Press Release. Bookmark the permalink.